he heart is an emblem of love, sorrow, joy, affection, and compassion. It is symbolic of eternal bonds, desire, and spiritual aspirations. It is life. It is love. It is our emotional center. 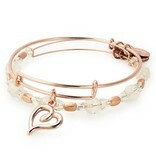 This Handwritten Heart Set of 2 Bangles, in Shiny Rose Gold Finish, features one heart bangle and one bangle with sparkling, complementary beads. Wear them together or separately as a reminder to keep an open heart. Life, love, our centers — the heart is a symbol of all emotions.